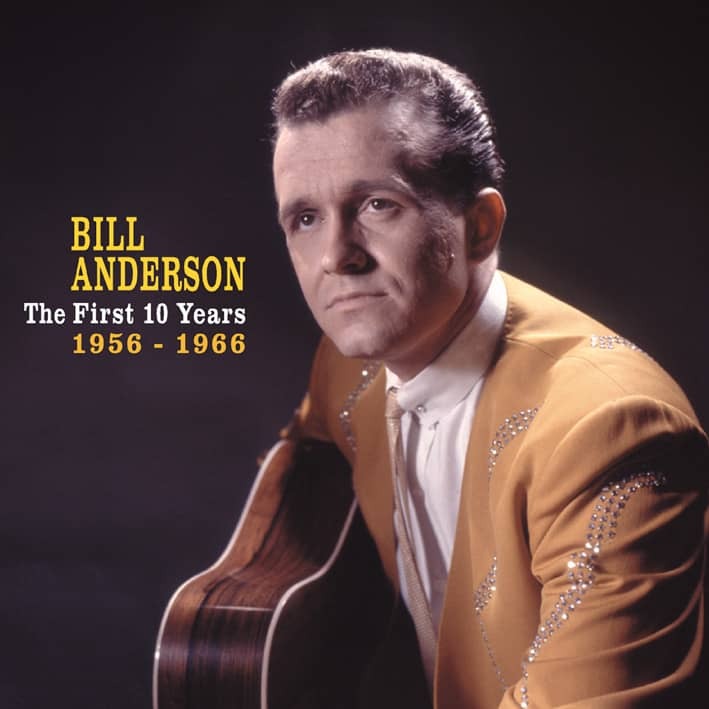 The 1960s might almost be called the Anderson Decade in country and western music. It's been a rare week when an Anderson song, recorded either by himself or by another major artist, has not been on the national country hit charts. At times, there have been two or three Anderson numbers on the charts at the same time. 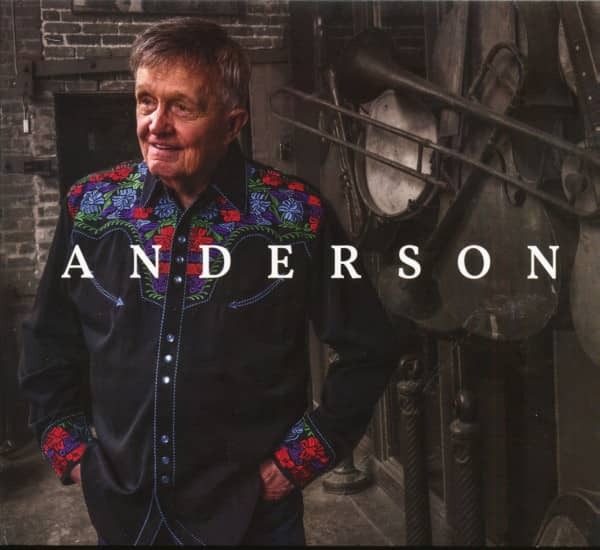 From a contemporary perspective, it's easy to overlook Bill Anderson's significance during that tumultuous decade in American history and country music. The self-made critics who track popular culture usually cite Merle Haggard, Loretta Lynn, George Jones, Buck Owens, and Johnny Cash as country music's major artists during those years. While Haggard's and Lynn's trajectories tipped upward, Jones treaded water through popular but mostly forgettable hits. Owens's career rose and fell, while Cash's fell and rose. But Anderson came in on a high note and stayed there. 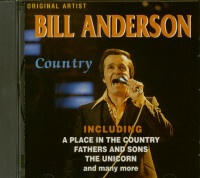 Through that decade, Anderson remained a consistent Top 10 country singles artist, his records seldom dipping below that peak well into the seventies. Six of those singles crossed over into the pop charts. 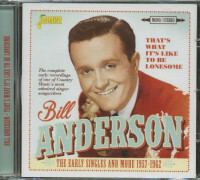 A master communicator, Anderson was inducted into the Grand Ole Opry at age 23. In 1964 he assembled the Po' Boys, one of the era's great back-up bands. 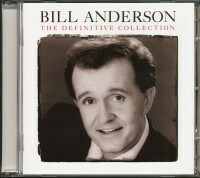 The following year he launched 'The Bill Anderson Show,'a low-key syndicated half-hour running in major television markets nationwide. As one of the industry's most prolific songwriters, he penned career-boosting hit singles for Porter Wagoner, Jim Reeves, Lefty Frizzell, Faron Young, Roy Drusky, and Connie Smith. 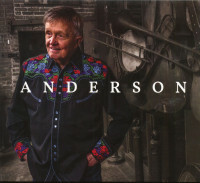 Today Anderson is one of country music's respected elder statesmen. Younger artists still seek him out for his new material, while others mine his vast back catalog for potential hits. Anderson's popular 'Country Family Reunion' concerts and videos provide a relaxing platform for his heroes and peers, while attracting audiences who share his passion for Nashville's golden era. Outside of superficial, indifferently assembled 'hits' packages, the music he recorded during the ‘Anderson Decade' has eluded reissue. To be sure, his intimate early Decca love ballads never appealed to the predominantly male record-collecting fraternity – the crowd that idolizes the Owenses, Haggards, Lynns, Joneses and Cashes. But there's more to the singer than the sentimental ballads and semi-recitations that landed him the nickname 'Whispering Bill.' 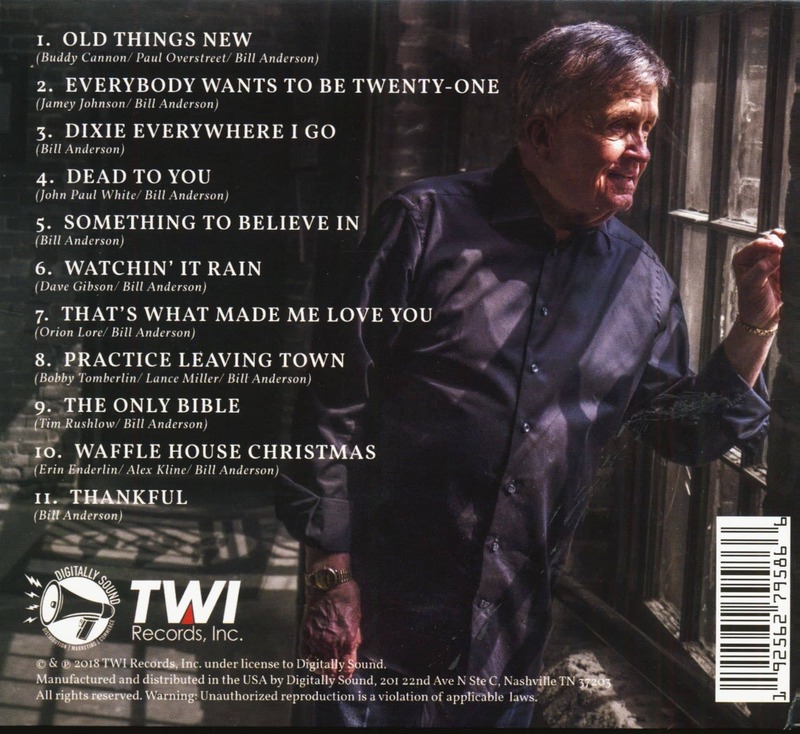 His TNT and Decca catalog includes rockabilly, Texas shuffles, Nashville pop, saga songs, power ballads and a touch of bluegrass. All are overdue for rediscovery. The Anderson family originally hailed from Pike County, Georgia. In 1920 James William Anderson, Sr. sold his farm to open an insurance agency in nearby Griffin, Georgia. The business evolved into the Middle Georgia Mutual Insurance Co., which remains in operation today. On weekends the elder Anderson played fiddle with his brothers as the Anderson Family Band, mostly working square dances and Griffin social events. His wife, Elizabeth Williams Anderson, played parlor guitar, but only for her own amusement. Their only child, James William Anderson, Jr., inherited his parents' work ethic, if not their musical talent. In 1933 he was an Atlanta correspondent for the newly formed Dun & Bradstreet, gathering financial data about regional businesses for use in credit evaluations. On September 27, 1933 he married Elizabeth 'Lib' Smith, whose father was the former pastor of Griffin's First Methodist Church. Soon after the wedding, Dun & Bradstreet transferred him to Meridian, Mississippi. Three years later the agency moved him to Columbia, South Carolina, where the couple's first child, James William Anderson III, was born November 1, 1937. A daughter, Mary Elizabeth, arrived four-and-a-half years later. 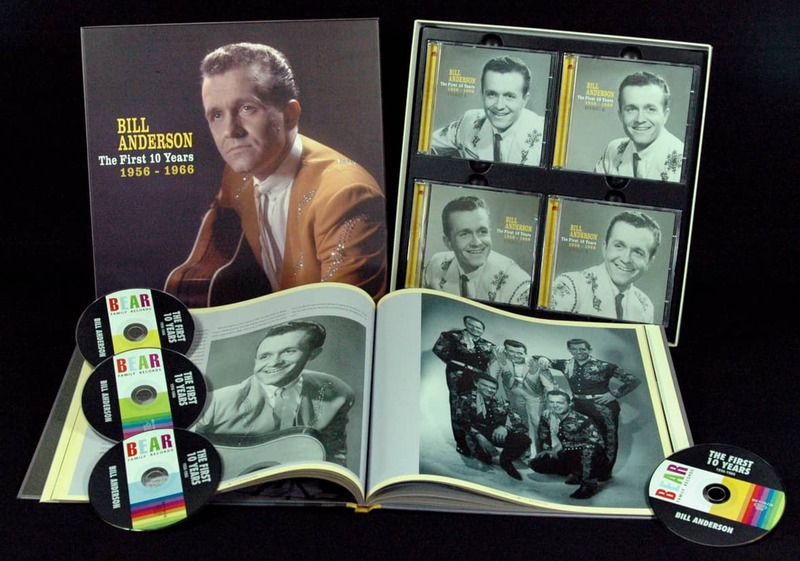 From the start, young Billy Anderson was attracted by virtually everything he heard on family's small Philco radio, especially the live country music shows broadcast over WIS, Columbia's oldest and largest station. His favorite act was Byron Parker and His Hillbillies, who were featured on three daily shows. The youngster listened carefully as the silver-tongued Parker, billing himself 'The Old Hired Hand,' extolled the advantages of his sponsors' flour, tires and laxatives. Parker's pitches were punctuated by music and broad comedy from his well-seasoned string band, which included fiddler Homer 'Pappy' Sherrill, bassist/comedian Julian 'Greasy' Medlin and DeWitt 'Snuffy' Jenkins, whose innovative five-string banjo picking inspired pioneering bluegrass stylists Earl Scruggs and Don Reno. The Andersons' next-door neighbors had a daughter who worked as WIS's receptionist. When Billy was about five or six, she took him to a live broadcast of Parker's morning show. "Byron Parker came over to where I was seated in the corner of the studio and talked to me, asked me my name, then introduced me to some of the other musicians in the band," Anderson recalled in his 1989 autobiography, 'Whispering Bill.' "Then when their show started, Byron Parker, The Old Hired Hand himself, said my name on the radio so my mother and dad at home could hear that I was there. I honestly don't remember another day in the early years of my life when I was as excited or as happy." Although he faithfully listened to Parker's broadcasts for the next two years, Billy Anderson never saw The Old Hired Hand again. Parker couldn't play an instrument and limited his singing to bass harmonies in the band's gospel quartets, but the youngster never forgot him. After watching Anderson perform at a North Carolina show in the early sixties, Don Reno commented on the singer's similarities to Parker, who died unexpectedly in 1948 at age 37. "Boy, you sound like him and you move like him, and from what I saw tonight you handle an audience just like he did," Reno told him, never suspecting that Anderson knew – much less heard of – the long-deceased broadcaster. "I don't think I slept a wink that night," Anderson recalled a quarter-century later. Even now, Reno's words still resonate in Anderson's memory. That was the most amazing things that ever happened to me in my life, he admitted in 2011. "Even today I get chill bumps when I think about it, because he didn't know that I even knew who Byron Parker was. And when he told me that's who I reminded him of, it almost brings tears to my eyes today. To think that that man had that kind of an influence and impact on me … it's amazing!" Customer evaluation for "Anderson (CD)"